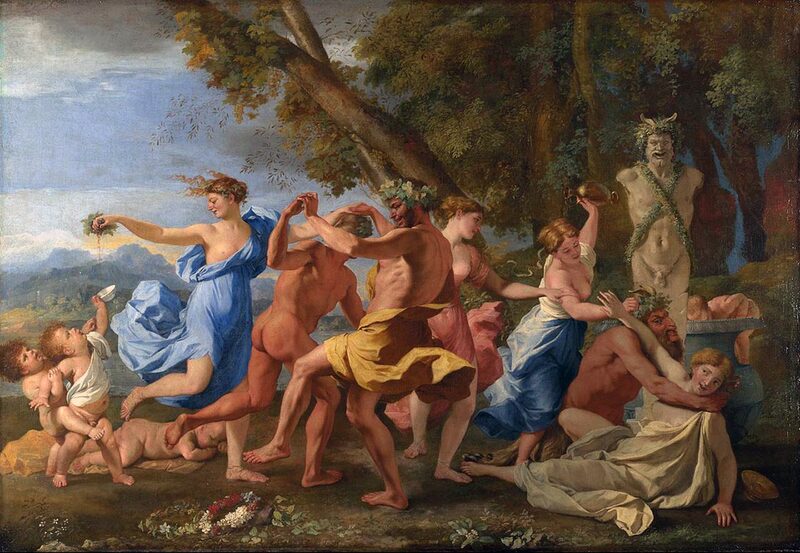 Nicolas Poussin – A Bacchanalian Revel before a statue of Pan, 1632/33. Don’t hold it against me, but I’m endlessly fascinated by bacchanals – from references in the classics, in fine arts, in Lord Byron’s poetry and the 1990’s bestseller The Secret History by Donna Tartt, to the more recent instances in Sideways: A Novel, Sideways: The Movie, and Rex Pickett’s recently republished Vertical: Passion and Pinot on the Oregon Wine Trail. Bacchanals belong to a parallel universe at the fringes of an often too restrictive society. They constitute a time and place where people can let their hair down, decompress, lose control and connect with the wilder, darker sides of human nature – before suiting up again the next day and reassuming their role in civilisation, pretending nothing happened while hoping there won’t be any evidence to haunt them on social media forever after. Our modern-day bacchanals come in many shapes and sizes, from a drunken night out of town, to frat parties, carnivals and post-soccer-match revelry. They’re a phenomenon I love to study, don’t mind flirting with on occasion, but wouldn’t want to live in all the time. Which is part of why stories like Sideways and Vertical have such strong appeal: you get to vicariously live Miles & Jack’s exploits and adventures from the safety and comfort of your own home, in the company of a good glass of Pinot Noir. Then, when you close the book, nothing irredeemable has happened in real life. Vertical is a worthy successor to Sideways, and – like the first novel – it takes you on a rollercoaster of emotions, from sympathy and recognition to worry, disapproval and cringing embarrassment. It’s a good sign when an author manages to pack so many layers of humanity in a novel in which surprisingly little happens. In less than 400 pages, Rex Pickett deals with heavy topics like incurable insecurity, alcoholism, midlife crisis, human relationships, unexpected fame and caring for an ageing, ailing parent, while interspersing it with slapstick, wine groupie hook-ups, witty conversation, lively character depictions and stunning wine country scenery. As a result, Vertical breathes a deep-rooted love of life. Not Life as we might have planned it, but as it is playing out, day by day, one sad, funny or awkward incident at a time, punctuated by that greatest of all libations: wine. On a side note: I didn’t care much for the illustrations in this edition and found the ‘Rexicon’ vocabulary list at the end unnecessary and, frankly, patronising, but this didn’t detract from the fact that I really enjoyed the novel, and would happily recommend it to any wine lover with a penchant for ‘all things human’. @VerticalTheBook breathes a deep-rooted thirst for life – as it is playing out, day by day: one sad, funny or awkward incident at a time. What an interesting post, Kristel. I love Sideways, the movie. But, would not have thought of it as compared to the depictions in art. Yet, very true. I need to watch it again, now, with a glass of wine. As long as it’s not Merlot! ? Thank you!